For more than a week, thousands of people — mostly students — have been protesting in the streets of cities across Albania, demanding serious and systematic changes to the country’s education system. 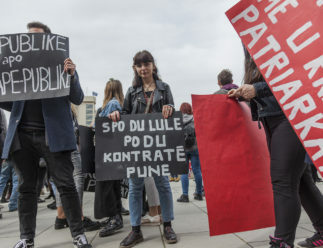 The biggest protests have been taking place in front of the Ministry of Education and Sports in Tirana, where protesters from other cities came to join their peers and boost the numbers this week. “We don’t want negotiations,” “We want European education,” “We are students, not clients,” “Cut the fees,” “No politics,” and “No political parties” are just some of the slogans that can be seen on the streets. 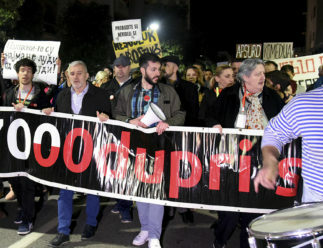 The past days have also seen protests in other cities in Albania, including Korça, Gjirokastër, Durrës, Shkodra and Vlorë. 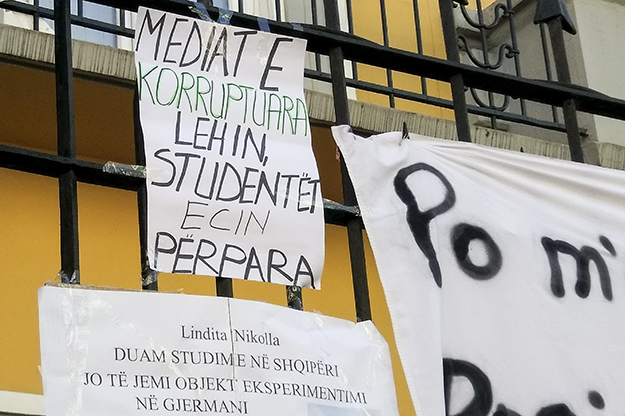 Everything began on December 5, with about 100 students from the Faculty of Architecture in Tirana, before protesters in Durrës and Elbasan also took to the streets. The next day, more students boycotted lessons and joined in, bringing the public universities to a standstill as the numbers of protesters have steadily risen. The initiation came after the Council of Ministers passed Decision no. 288 in May, Article 4 of which obliges students to pay extra fees for retaking exams. However, the decision was not publicly discussed at the time and received minimal media coverage. Many students were completely unaware of it as the universities didn’t take the time to explain the change to students or what the decision meant, meaning that this issue has only recently come to wider public attention. However, the root of the problems goes back to 2015 and the introduction of a new Law on Education. Article 3 of the Law gave public universities greater autonomy in terms of finances, academic autonomy, organization and staff selection. At the same time, this type of autonomy has meant that the universities have been receiving less money from the state budget, and instead given the opportunity to find other ways of financing themselves. The potential methods provided for in the Law include collecting money through teaching or scientific research activities, intellectual rights, trademarks and patents, as well as through artistic and sporting activities, and other economic activities. 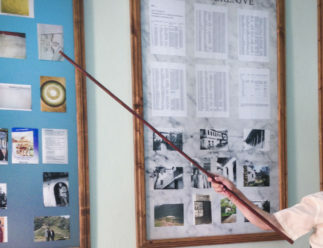 In 2013, Prime Minister Edi Rama promised that spending on education would rise to 5 percent of GDP, but actual spending has never reached more than 3 percent. Meanwhile, students have been feeling the pinch of increased and additional fees in recent years. Students have been backed by a number of professors, including Dhurata Shehri, who says she has opposed the Law on Education since it was first introduced. A professor of literature at the University of Tirana for 23 years, Shehri told K2.0 that all the students’ requests are fair and realizable. Shehri added that the current protests, the biggest in recent years — which are not being led by a political party — could be considered a reaction that has been missing in Albanian society for a long time. Bërxulli claims that in Tirana the conditions are much worse and that everything is more expensive for a student. “The rent is higher and the conditions in the dormitories are miserable,” he said. What exactly do students want? On the first day of the protests, the students on the streets made a list of four demands: repeal of Decision no. 288, student representation on management boards of higher education institutions, improvement of dormitory conditions and the halving of all student fees. Prime Minister Edi Rama reacted via Twitter, writing that the request for the new exam retake fee had come from the deans and rectors of Albania’s universities, and not from the government itself. 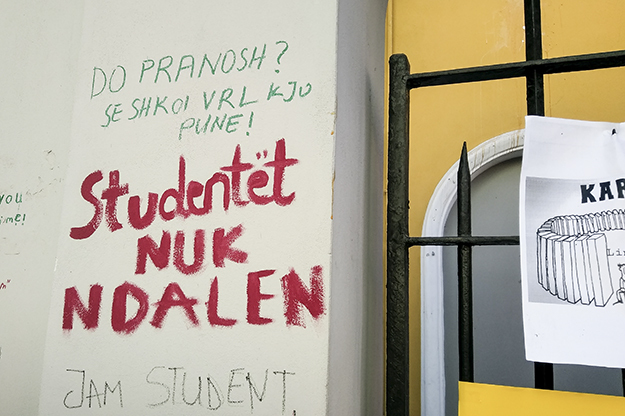 However, earlier this week his statement was rejected by the University of Tirana, which issued a public declaration saying that it had not requested any additional fee and that it supports the students’ requests. Yesterday (Dec. 13) the students’ demands also received support from the University of Arts through a public declaration. The Ministry of Education has said it accepts the request to scrap the intended exam retake fee. “Students have the right to [ask for] all four points. There won’t be another fee for the students who repeat exams,” Minister of Education Lindita Nikolla told a press conference on the second day of protests. But, the students said it was not enough and that they would not negotiate their demands. The prime minister has repeated requests — made mostly through his social media channels and his own Facebook TV channel, ERTV — to talk to the students almost every day since the second day of the protests, saying he is willing to try to find solutions. But to date, students have declined all offers to meet and have added to their requests, which now also include more transparency in the budgets of the Ministry of Education and higher education institutions, and an increase in student involvement when it comes to electing academic staff. 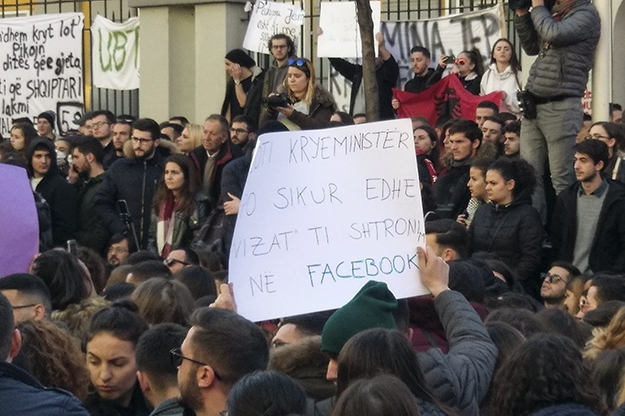 Yesterday (Dec. 13), during a session of Albania’s Parliament, students moved their protest to the Parliament building and repeated that there wouldn’t be negotiations nor a dialogue between them and that the government needed to deliver on their eight requests. At the conclusion of the parliamentary session, students continued their protest outside the Prime Minister’s Office, where they have also gathered again today (Dec. 14). And they have been joined by others who support their cause. 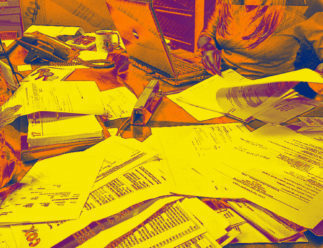 Evaluate teaching performance, require teachers to have their research published online, as well as lectures published online. 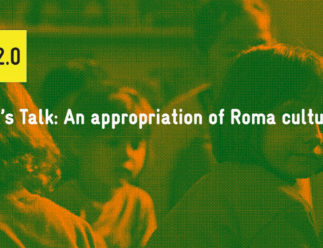 ABOUT THE AUTHOR Fjori Sinoruka has a BA in journalism and communications from the University of Tirana. She is currently doing her MA in public relations. Fjori is part of the Albanian Centre for Quality Journalism, and works as a journalist in Albania.